QUESTION: In what format was Hi Infidelity not released in 1980? 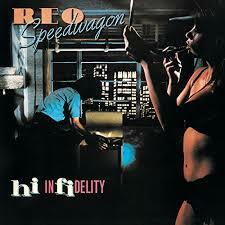 By 1980, REO Speedwagon had released eight studio albums and one live recording. Prior to 1977, they made little or no impression on the charts, but then the fortunes of the band began to change. Their Live: You Get What You Play For began a turn for them that only strengthened with the next year's You Can Tune a Piano, But You Can't Tuna Fish. Two years after that, they released what would become their biggest album yet and, as time would prove, their biggest album ever: Hi Infidelity. It would change everything for the band, with six of its ten tracks being released as singles, and "Keep On Loving You" and "Take It On The Run" reaching the top ten. The album went Platinum nine times over, selling ten million copies and becoming the best selling album of 1981. One reason Hi Infidelity became such a huge hit, it can be speculated, is because it exploited a new way for bands to reach a wider audience, something called MTV. In fact, lead singer Kevin Cronin was recruited by the Music Television channel to be one of its first VJ's. He declined, as the story went, since it would have required that he leave the band. The band remained hot for a number of years, although it proved unable to sustain the immense popularity they enjoyed at the beginning of the 1980's. They continue to perform in live venues to this day. We are extremely confident that, if you attend any of these performances, you will hear "Take It On The Run" and "Can't Stop Loving You." ANSWER: B) Compact Disc. That would not happen for five more years.